One evening after I had finished speaking to a gathering of men, a huge, burly man came up to talk to me. The guy was a mountain; I could picture him chewing up quarterbacks and spitting them out. Immediately, I agreed. (I didn’t think I had a choice.) It wasn’t until later that his words sank in. Adoptive fathers are too often forgotten, even as many of them are redeeming and changing lives that might otherwise be forgotten. Adopted fathers do deserve our praise. They are answering a need that I think all children feel: they want to be attended to, to be claimed. I’m reminded of the “Orphan Train” of years past. A real train – full of orphans. It carried abandoned children from town to town, until someone finally claimed them and gave them a home. I believe many of the children in our culture have that same emptiness – and not just physically abandoned children. It applies just as much to children who have been emotionally abandoned. Think about it: an adopted child has physical evidence that he is a valuable and wanted part of his family. He has adoption papers. Biological children don’t, and I fear that too many of us take our kids’ sense of belonging for granted. Are your kids considered precious in your household? Do they know that they are loved and highly esteemed? The act of adopting is something that all of us fathers need to do. Not through legal paperwork, but rather in the everyday physical and verbal nurturing of your child. 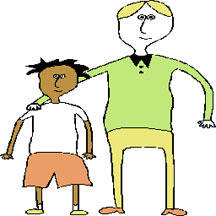 Adopted or not, claiming children as our own will produce a generation of men like this big, burly man whose adopted father had died, but who wanted to pay tribute to the one who gave him an eternal inheritance. I’m thankful for the reminder from my new friend. My hat is off to your father and all the dads who are continuing to adopt their children.